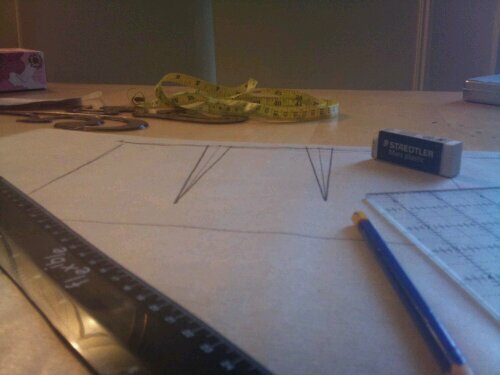 Author kokorimbaudPosted on November 24, 2012 November 24, 2012 Format ImageCategories My designs, SewingTags patterns, self-drafted, snapshot6 Comments on Can you guess what I’m doing? As mentioned earlier this week, my current goal is to replace worn-out pieces in my wardrobe by shiny, new, hand-made ones. The first step in that direction was that I made a knock-off of one of my long sleeve t-shirts. These are the items in my wardrobe I reach for most often. 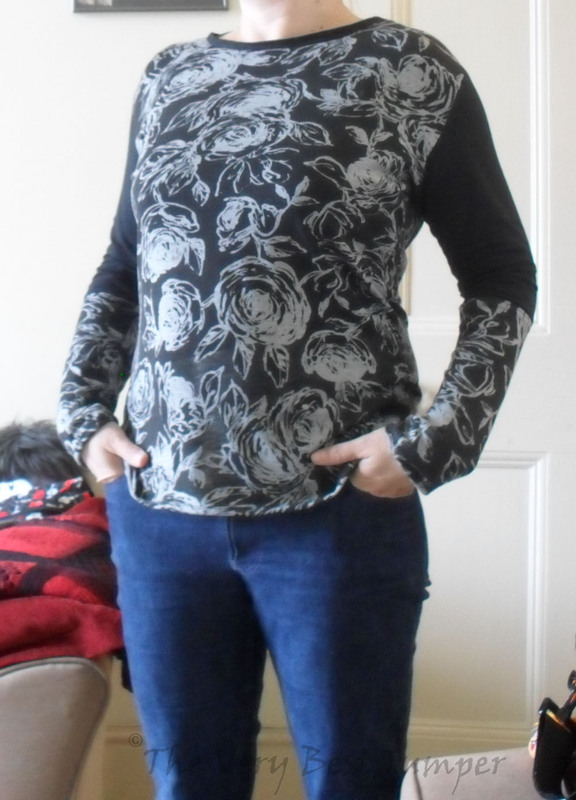 Most of my tops get worn with one underneath them. So they should be reasonably neutral, but also be able to stand up on their own, because they might just as well end up under one of my cardigans. My first one turned out alright, but a smidge tight. By which I mean perfect for under, absolutely not acceptable for nothing over. I really don’t believe mine are abnormally long, but more often than not long-sleeve garments end up being just a tad short. You know, that “barely half an inch” which means it’s still wearable but ever so often you’ll find yourself pulling the sleeve down a bit? Fixable 😀 Now I can have t-shirts down to my knuckles if I desire so (and I just might). For some reason beyond me, that seems to change every year. Last year, stepping into Le Primarche, you couldn’t breathe for elastic, long sleeve t-shirts long enough to be tucked into your pants (or draped over that awkward spot where sitting down in a low rise jeans will always be risky). This year? You’re one lucky digger if you find some which cover your belly button. And mine doesn’t like to be out in the wild. Also, totally fixable 🙂 I can have them loose fit and touch my belt buckle lengths, I can have them tunic lengths, or … well, you get it. Awesomesauce. On to the next one. I added an inch to the body width, took the shoulders in a bit, lowered the shoulder seams a bit (keep in mind, the highly scientific method of obtaining this pattern was to draw around an existing one on brown paper), and added 1/2 inch to the width of the arms and armscye. Enough ease, but not too boxy. The body is actually a wee bit too long, but I could fix this easily. The knit jersey fabric was part of my loot from Walthamstow Market, a trip inspired by Didyoumakethat, about which I’ll tell you more soon. So much now: it was brilliant. I had to frankencut the sleeves, as the fabric was the end of the roll and they didn’t have enough left for me to cut the full t-shirt. 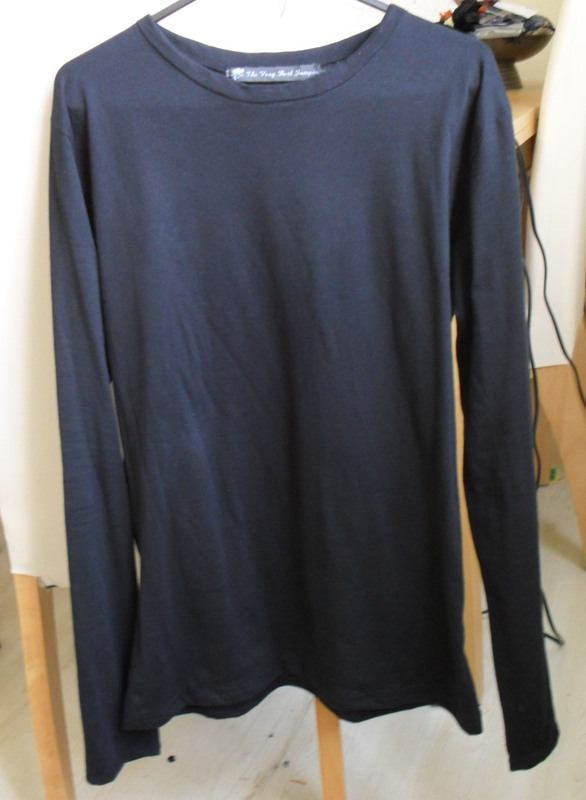 That meant I had to use some stashed black jersey for the arms, which I think might have been a blessing in disguise and could well be what saves this top from looking like a Goth’s pajama (not that I’d have issues with that – I just want to be able to wear it in public …). 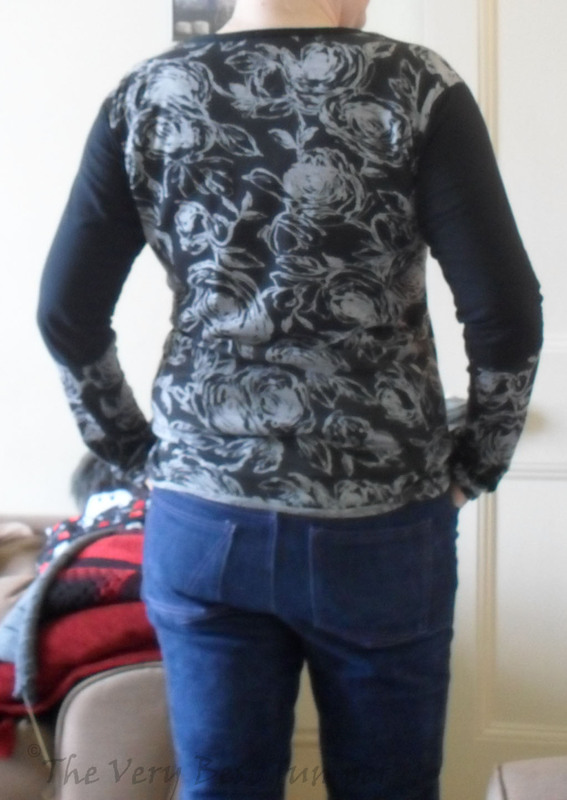 For future makes, I might play around with the shoulder width a bit more, I think it’s still a bit too wide, but for now, it totally works for me.